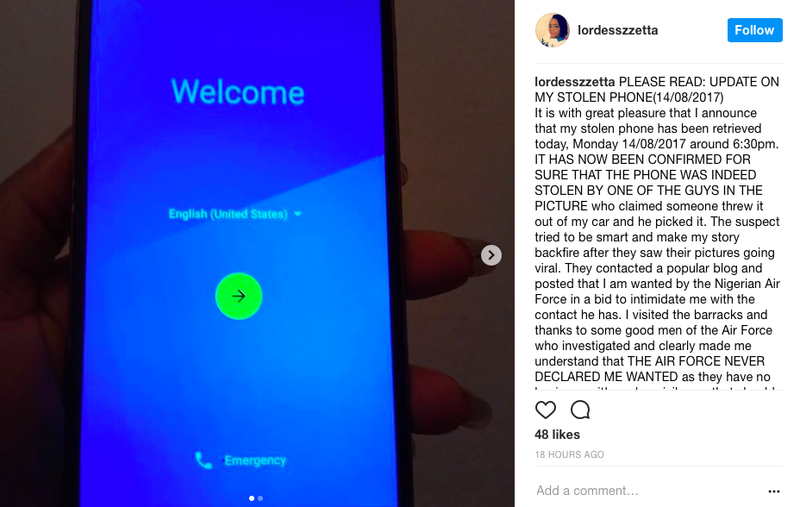 Remember the phone thieves who stole a photo and took a selfie with it? They have been caught. The owner of the phone @lordesszzetta took to Instagram to give an update about the stolen phone. It is with great pleasure that I announce that my stolen phone has been retrieved today, Monday 14/08/2017 around 6:30pm. 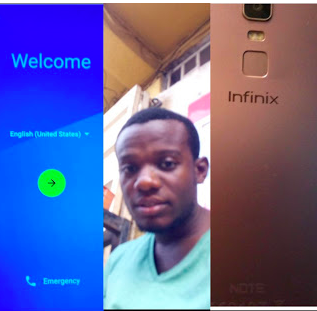 IT HAS NOW BEEN CONFIRMED FOR SURE THAT THE PHONE WAS INDEED STOLEN BY ONE OF THE GUYS IN THE PICTURE who claimed someone threw it out of my car and he picked it. The suspect tried to be smart and make my story backfire after they saw their pictures going viral. They contacted a popular blog and posted that I am wanted by the Nigerian Air Force in a bid to intimidate me with the contact he has. I visited the barracks and thanks to some good men of the Air Force who investigated and clearly made me understand that THE AIR FORCE NEVER DECLARED ME WANTED as they have no business with such a civil case that should be handled by the police. Indeed the culprits plan did not work out as there were loopholes in his story which gave him up. Thankfully, the officers on duty ensured the phone was retrieved and handed over to me. His motive behind taking the case to the Airforce failed and backfired. The suspect will certainly be facing the wrath of the law for false alarm and lying on the force that I was declared wanted. As you can see from the picture of the phone, the culprits had no intention of returning it as they wiped off all the information in it and restored it to factory settings to either make use of it or sell. The police were duly informed of the case and have been updated on all recent developments. Thank you all for your support and kind words.ZZETTA.